John’s gospel is best place to find clear indicators that Jesus cares: his conversations were comforting; and his care fed people – at the Cana wedding, the 5000 at the beach in Galilee, and He gave living water to a Samaritan woman and her relatives. His food and counsel bring peace to every thirsty soul that reaches out to receive from Him. The need for peace is real – at levels personal, institutional, national, regional and international. How many people are fighting within over food, unfulfilled goals, career and business choices, disappointments at work or in relationships…? Although he or she may look good on the outside, someone is inwardly fighting an abusive or deficient upbringing, inherited spiritual bondages, close people stealing property, or uncertainties about the future. And these very conflicts are the seeds that grow into costly armed wars we have seen at home, in South Sudan, Somalia, Nigeria, North Korea – all over the world. I consider the highest expression of Jesus’ care to be his greeting, ‘Peace be with you!’ The food he gave brought temporary relief from the problem of hunger, but the Peace he gives brings everlasting welfare. ‘Shalom’ (‘Peace be with you’) was and still is a normal greeting among the peoples of Middle East; but just like the English may hastily respond, ‘Fine’ to the greeting ‘How are you?’ – even when troubled deep inside – one may not really feel or receive peace when they respond affirmatively to the ‘Peace’ greeting. It is now time to receive revitalizing effects from familiar words; the one speaking is not just throwing a casual greeting at you; His names include Prince of Peace and Wonderful Counselor. The reason most people will say ‘I am fine’ is because they don’t expect that person to do anything about their troubles. 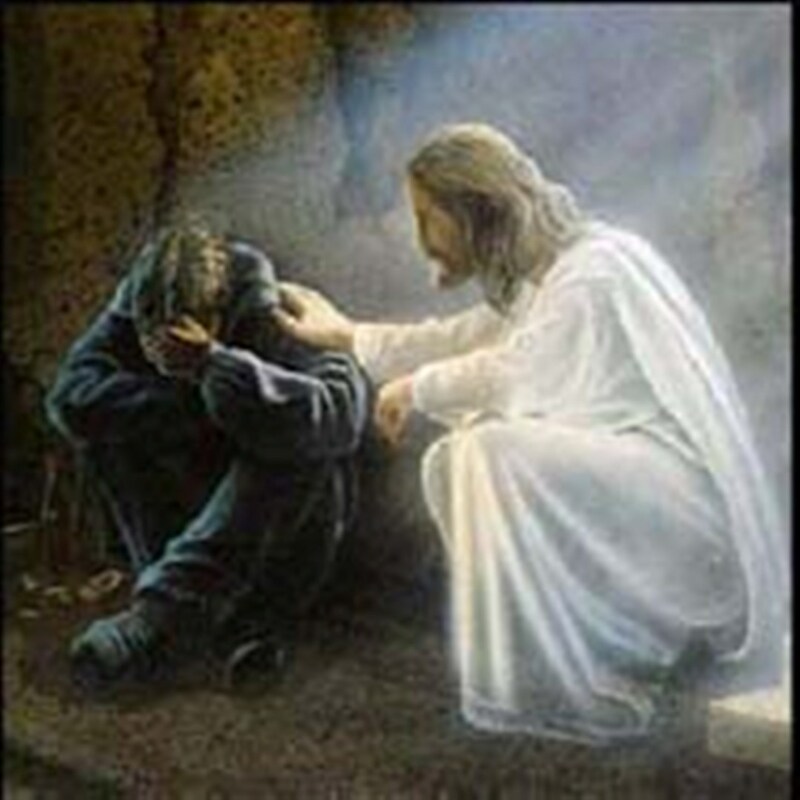 But Jesus is not like that person who greeted you and didn’t even wait to hear your response; Jesus Christ will stick by you and listen to more than you can share – tell him the real deep truth, and may His greeting of ‘Peace’ bring you comfort and joy. Jesus cares. As we pray for peace in the world, let us recognize that it begins within one individual; let us therefore seek to receive from the Prince of Peace what we need to be restfully content – ‘cast your cares upon the Lord’. And let us be agents of this peace; encouraging someone and helping just one person overcome the battles within could arrest a looming strike or rebellion. In their fellowship, Jesus Christ spoke Peace to them twice before He commissioned the disciples. He knows the depth of our needs and will not rush away; be sure He is attentive to you. It is a great privilege to serve a King. Nothing has changed since the days of King Saul; just like Jesse was pleased to send his son David with gifts to show his gratitude for the privilege to serve, ministers today will always thank the President for having trusted them with this office or that, in almost every speech wherever whenever. David was pleased to serve (1Sam 16:14-23), the Twelve were happy to follow and be with Jesus the great Rabbi, and also the women were happy to give and support this noble ministry. Today is the Feast of Mary Magdalene. She was one of the women that helped to support Jesus’ ministry; she had been healed and was now eternally thankful. Even after Jesus suffered, died and was buried, her commitment remained; she visited the tomb to anoint Jesus’ body. She refused to leave after realizing that her master’s body had been ‘stolen’! In the end, she saw Jesus alive again, and went on to tell the good news as the first evangelist. Mary Magdalene carries great inspiration through the ages – not only for women but for all people. We can draw many lessons for her life, discipleship and ministry; for today, let us concentrate on the privilege of serving. Many of us have embraced this privilege – thank you! The construction team had stressful and tiresome Friday last week as they cast concrete, but they rejoice at the privilege to serve. Kakumba Chapel embarked on the vertical extension of the Chapel Hall to create more working and ministry space and a multi-purpose Hall which will majorly be used as a Teens’ Chapel, and also for fellowships, meetings, parties, short courses and University lectures and exams – the Musiime Hall. The motivation of these physical development actions is the Gospel; we want the good news of Jesus Christ to reach more and deeper, and to equip more people to go and proclaim the same. All these are service opportunities. Our teens need deliberate focus; they are in transition from being children to becoming adults, and are many times lost in between; yet they face potentially confusing circumstances both from internal changes happening in their bodies and from external influence by peers real and virtual. Whether by your generous contribution to the building project or by your presence and participation in their services, seize your opportunity and privilege to serve these young people in Jesus’ Name. If you dare to ask and listen, there are many opportunities to serve the greatest King of all. It is rewarding now and eternally, but it is also peace-giving when you fulfill the purpose for which your Creator made you. Take the opportunity heartily and enjoy your privilege totally. Prophet Joel concludes his short message with an account of the future glory of Judah and particularly the LORD’s house. Physical developments and peace are God’s way of showing us His glory and favour. Prayers to enthrone the Wonderful Counselor and Prince of Peace, and giving to build for His glory are very important activities in the Church. We need peace and development seen on Kyambogo hill as our dwelling, our Jerusalem, and we are the Temple of the Holy Spirit. Prophet Jeremiah and King David in their various messages gave us inspiration and encouragement to pray for our city. And at Kakumba Chapel, it is time to rally our efforts in this direction – it is time to build. Kakumba Chapel embarked on the vertical extension of the Chapel Hall to create more working space and the Musiime Hall – a multi-purpose Hall which will majorly be used as a Teens’ Chapel, and also for fellowships, meetings, parties, short courses and University lectures and exams. The motivation of these physical development actions is the Gospel; we want the good news of Jesus Christ to reach more and deeper, and to equip more people to go and proclaim the same. The gospel liberates and gives life and light. Our teens need deliberate focus; they are in transition from being children to becoming adults, and are many times lost in between; yet they face potentially confusing circumstances both from internal changes happening in their bodies and from external influence by peers real and virtual. Listen to the progress update and seize your opportunity to participate in this noble cause of building. At least Ugx 280 million has already been spent (since July 2017), and the foundation, gallery (first) and second floor structures are up. Decking and all preparations for the third floor are almost complete. Thank you for your giving! Next: we hope to cast concrete for this floor this week on 18th-19th July 2018. We need to raise more money for the concrete and the next tasks, which include fixing windows and doors in the lower floors, and building walls to enable the completed sections to be used safely. Meanwhile the University Top Management commended and blessed the project and we are grateful for their continued support. I call upon you to support the physical prosperity and peace through your generous contribution to the building project at hand – the Musiime Hall Project. Joel reminds us through his three chapters that when a hard message comes from the Lord, it is not to discourage us to despair. It is to wake us up and align us to God’s purposes and will; and this starts with repentance, reconciliation, and goes on with re-building and building new structures which stand as testimony of God’s goodness and His glory. Joel has a chorus for us. When some message is repeated, those accustomed to music are quick to call it a refrain or a chorus, just like ‘Praise the Lord, praise the Lord…’ in the anthem-like hymn ‘To God be the glory’; not many people may know all the verses off-head, but majority will gladly join in the chorus when the few have finished each verse. This chorus normally bears the central message of the hymn, the core that completes each verse, so that if someone knows only the chorus, they know the hymn’s entire message approximately. Songs with a repetitive chorus are easier to learn and remember; even writers of poems and other prose-like pieces find some kind of ‘chorus’ to embed in their writings to facilitate memory for the main point. Declare a holy fast, call a sacred assembly. For the day of the LORD is near! In Chapter 2 (read), this Day is described as an unstoppable mighty army approaching to conquer and destroy utterly, in the same spirit as the appallingly destructive locusts of Chapter 1. This vivid picture is supposed to frighten all apart from those that will be shielded by the LORD himself – those who call upon Him in spirit and in truth. Hope us unveiled for them in this very Chapter. Unfortunately, many of the others put up an unfounded bravado that makes them deny the veracity of this shaking message; they continue in idolatry, fornication, stealing, or even lukewarm-ness, disregarding the Lord! They hope they will escape somehow by their own might and power, or perhaps the Day will not come at all! God has assured us of the certainty of this message by bringing surprises in fulfillment of parts of this prophecy. For example, the bewilderment that confounded the cosmopolitan feast at Jerusalem in 27AD demanded explanation beyond the speculations of the spectators. The leader of the fire-spitting tongue-speaking band is Simon Peter, and he will clearly explain; and here is the most important spot where we find Joel standing tall as the Prophet to be quoted in the Pentecost sermon: “This is what was spoken by the prophet Joel: ‘In the last days, God says, I will pour out my Spirit on all people’” (Acts 2:16-17, Joel 2:28). As surely as the Pentecostal outpouring happened, so shall the dreaded Day of the Lord come. Your only hope is to hide in Jesus Christ the Rock. The bewilderment that confounded the cosmopolitan feast at Jerusalem in 27AD demanded explanation beyond the speculations of the spectators. The leader of the fire-spitting tongue-speaking band is Simon Peter, and he will clearly explain; and here is the most spot where we find Joel standing tall as the Prophet to be quoted in the Pentecost sermon: “This is what was spoken by the prophet Joel: ‘In the last days, God says, I will pour out my Spirit on all people.’” (Acts 2:16-17). More of this will follow next week, but for now let us go to the beginning of his good book. In his opening chapter, the Prophet Joel sharply calls for attention to a calamity that recurs to create worse and devastating calamity! The end is in contrast very bright and hopeful. In his book, there is a progression in the thought, rising from the solid, sorely smitten earth to a region ethereal, and the stages of advance are marked by sudden, sharp calls (Joel 1:2, 1:14; 3:9), or by the blasts of the trumpet which prelude the shifting scenes (Joe 2:1, Joe 2:15). The International Standard Bible Encyclopedia paints the contextual picture: The land has suffered from a succession of disasters, the greatest that could befall an agricultural country, drought and locusts. The two are in fact inextricably connected, and the features of both are mixed up in the description of their effects. The extent of the disaster is vividly depicted by the singling out of the classes on whom the calamity has fallen, the drinkers of wine, the priests, the vine-dressers, the husbandmen; and, toward the close of the chapter, the lower animals are pathetically introduced as making their mute appeal to heaven for help (Joel 1:18-20). If the Day of the Lord does not cause shivers in your body, soul and spirit, you must be made of iron or wood. Who does not feel an electric shock when a loved one is suddenly declared dead? Who does not tremble when a dear friend diagnosis comes through as ‘cancer’? Who is not worried about the nuclear weapons in North Korea? All these only give us a foretaste of how the Day of the Lord will terrorize creation. Joel comes like a doctor to immunize those who listen, so that the Day of the Lord will not take the toll it should have. Joel warns and recommends actions that will keep you safe when that time comes. Long before the Day comes – and it will come suddenly – turn to the Lord in worship, in prayer, in fasting, in total commitment in spirit and in truth – honour the Lord your God according to His Word, and you will be safe and secure, both now and on that Day.